Grab some 'bunny' and check out these Easter offerings the weekend of April 20-21, 2019. Image above: The 1 kilogram chocolate Botero Horse at the St Regis Kuala Lumpur. Those supping at Nobu over the next two weeks will obtain access to a limited desserts menu. Some Easter delights include a mascarpone cream Easter Bunny that's 'on the run'; a Hojicha Kakigori with peanut butter cream, mochi and almond crumble; and a Mango Yuzu Pavlova with yogurt ice cream and butterfly pea ginger yuzu syrup. The Nobu Easter egg filled with chocolate-miso macaroons, yuzu pistachio nougat and green tea grammy soft cookies is great for gifting at just RM50 (available April 19-23, 2019). Presided over by power women Carmen and Carmey Chua, the St Regis Kuala Lumpur has always put timeless family traditions on a pedestal. Happening at The Astor Room, the Easter Sunday Brunch is packed full of fun activities for little ones, including an annual Easter egg hunt and an egg painting station. Executive chef Pedro Samper has been flexing his culinary muscles to curate an extraordinary Easter spread; guests can anticipate Alaskan King Crabs and French oysters on a bed of ice, a carving station with roast beef sirloin, and a cheese bar so decadent it'll set a Frenchman's pulse racing. Loathe to rise early for brunch? Take your own sweet time rolling out of bed — you'll still make it on time for The St Regis KL's Easter Afternoon Tea. The site of many an important tête-à-tête, The Drawing Room is also where sweet dreams come true as chef de patisserie Hassan Mohamed shows off his skills. Afternoon Tea: RM238 or RM158 with or without a glass of Veuve Clicquot. 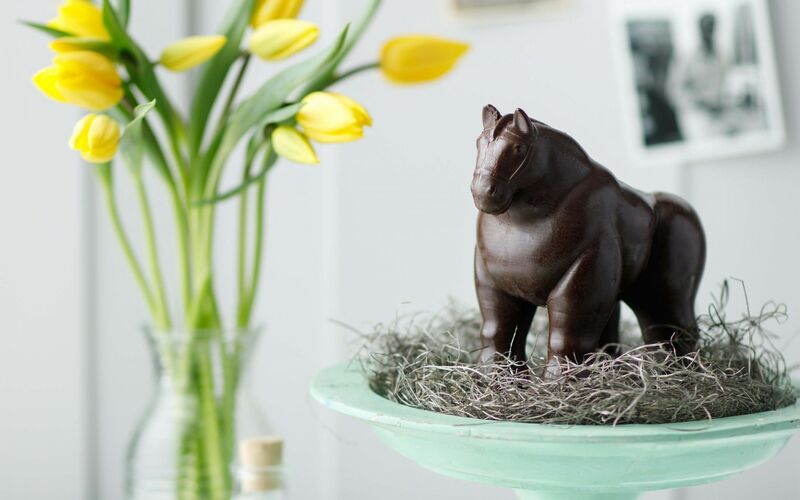 Take home a 1 kilogram Botero 'Horse' sculpted out of solid chocolate for RM188 (available April 11–21, 2019). Get the kids out of your hair this Sunday: Curate, one of our favourite all-day dining restaurants in town, will be organising a slew of Easter activities. Tuck into a terrific Easter spread and get set for a whole lot of action. Dress the kids up as their favourite characters and stand a chance to win the best costume contest. In addition to a craft corner and a cupcake decorating contest, a 'balloon bender' will be on site to craft souveniers for the guests. But the fun and games aren't limited to young ones; mum and dad too can participate in an egg hunt competition! 15% off your bill if dining in a group of 10 adults or more. More than 100 dishes feature on Le Méridien KL's Egg-citing Sunday Brunch this year. Assorted tapas will make the rounds at Latest Recipe, but be sure to leave room for the terrine of chicken liver pâté and duck rillettes. Loyal patrons have high praise for the salmon belly at the Japanese station as well as the dim sum selection at the Chinese corner. Where one-of-a-kind dishes are concerned, the Easter pizza topped with capsicums, tomatoes, mozzarella cheese, egg and crushed pepper is only available this time of the year, as are the Easter bunny cake, rainbow cake, and hot cross bun pudding with cinnamon vanilla sauce. Activities include egg painting, balloon sculptures, and face painting to guarantee that memorable selfie. Order the Hippity Hop Bunny Cake 24 hours in advance to split it among family and friends for RM180. Modern Australian restaurant and bar Drift, home to the best Bloody Marys in town (we can vouch for them and can safely say we've had one too many) is rolling out an Easter buffet comprised of Irish oysters, poached tiger prawns, Eggs Benedict, beetroot salad, Caesar Salad with crab, balsamic duck breast, and pan-seared barramundi. Let's not forget the sweet offerings such as cheese cake and dark chocolate eggs with raspberry sauce, an Easter special. Kids take home a goodie bag each. (Children) RM68 for 12 years and below or free if under 6. A bouncy castle on the veranda! The new kid on the block has become our fast favourite for its design forward sensibilities and small, thoughtful touches. Swing by one (or both) of its dining spaces for an Easter to remember: ATAS Modern Eatery is where Sunday's Easter Brunch will roll out in grand fashion whereas The LIBRARI's iconic afternoon tea will see seasonal specialities. Any order of afternoon tea comes with a complimentary glass of Cava (until end April with a possible extension of the promotion). Everyone in town must have heard of W Kuala Lumpur's epic Sunday #RETOX brunches by now; if you've yet to experience it, book yourself in for the 'Easter edition.' Entertainment comes by way of catchy beats by W music curator Victor G and magic tricks by an illusionist. Feeling lucky? Sign up for the Easter egg hunt and stand a chance to win a free night’s stay at the hotel. (Adults) RM288 or RM188 with or without alcoholic beverages; (Children) RM98 with free-flow juices, mocktails and soft drinks. Those daring enough to don a bonnet to the buffet receive 10% off their total bill!